Exact Cool Therapy™ (ECT50™) offers "optimum" healing benefits with none of the health risks associated with ice and gel packs. Exact Cool Therapy™ medically advanced cooling mechanism is known as TCC™ (temperature controlled cryogenics). Medical studies have proven that temperatures below 50°F damage tissue vital for healing as it reduces inflammation. 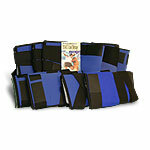 Most ice packs cool well below the optimum level and temperature varies with time. TCC™ brings to the world a unique temperature controlled fluid that freezes to the optimum temperature of 50°F. Exact Cool Therapy™ (with TCC™) provides safe and effective temperature of 50°F (10°C). This cold therapy slows metabolic activity of the injured tissue, further reducing the chance of secondary hypoxic injury to the affected area. Unlike frozen ice or gel packs, ECT50™ packs may be placed directly against the skin without fear of frostbite, irritation or soft tissue damage.